It’s no surprise that Nas’ Illmatic debut album is still thumping at the heart of hip-hop 20 years later. Known as one of the greatest hip-hop albums of all times with Nas’ raw talent and gritty lyricism, Illmatic continues to make big waves in the industry with the Nas: Time Is Illmatic documentary topped off with a year-long educational initiative. The 74-minute film, which first premiered at the Tribeca Film Festival in April, is available in theatres, on demand and iTunes, and will be screened across the nation during a tour throughout the month. Filmmakers One9 and Erik Parker, who attended a press conference Monday, September 9th with Nas at the Tribeca Film Studios, said this isn’t a film about hip-hop but rather an American story. The film strays away from the typical music documentary as it revisits the 41-year-old’s vicious Queensbridge, New York, childhood and tells the bigger story of the influences, such as his brother Jungle and their jazz musician father Olu Dara that helped shaped his music. Director One9 and Nas speaks with media at Nas: Time is Illmatic press conference. Nas, who dropped out of school after the eighth grade, sat astonished at the thought of a film that surrounded his life and hopes it will motivate young artists to overcome their odds. The education program, facilitated by Tribeca Film, Illa Films and the Hip-Hop Education Center, features an interactive web portal with lessons on songwriting, storytelling, researching, documentation, filmmaking, archiving and remixing Nas’ music. There will also be presentations in key communities in New York, Los Angeles, Detroit, Philadelphia and Oakland. 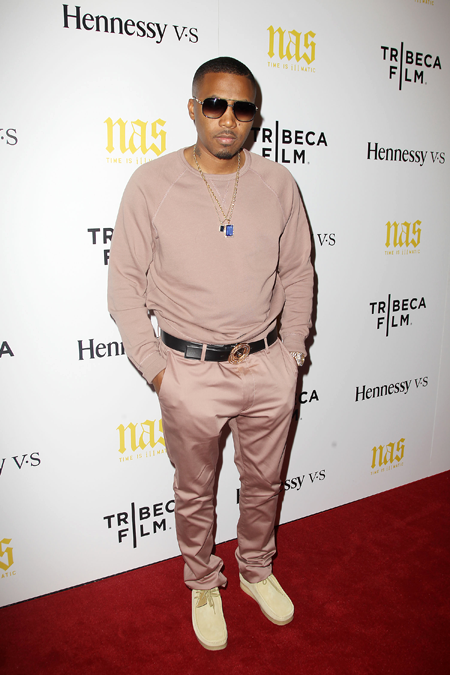 Nas said the film took him back to why he got started in the business and made him want to do a new record. “Back then, it wasn’t about ‘I’ma get rich tomorrow.’ It was to give people the story that came after Chuck D, after Eric B, after Kool G, after Ice Cube. We were like reporters who came after the greats,” Nas recalls. He said the film helped him remember the beginnings and gave him the footing to do what he’s supposed to do today. “I needed this,” says Nas.